Learning how to replace desktop hard drive with SSD can simplify the process of replacing hard drive. AOMEI Backupper is the most suitable software for you. Whyreplace desktop hard drive with SSD? SSD is the abbreviation of Solid State Drive. The following are reasons that you should replace desktop hard drive with SSD. ● Price on SSD is dropping, and operating systems are beginning to take advantage of the potential higher speeds of SSD. So it’s a good time to consider replacing desktop hard drive with SSD. ● Normally a SSD reads data at a much quicker rate than an HDD does. Therefore, SSD is especially good for storing an operating system and applications. For desktop users, replace hard drive with SSD would mean spending less time waiting for the computer to boot up and for data to become accessible. ● And it is also impossible for you that the desktop hard drive is old and running slowly, clone hard drive to SSD may be one of the best solutions to this problem. Which tool is the best for replacing desktop hard drive with SSD? To replace desktop hard drive with SSD is to clone hard drive to SSD. Finding a tool for the operation can help you save much time and energy. 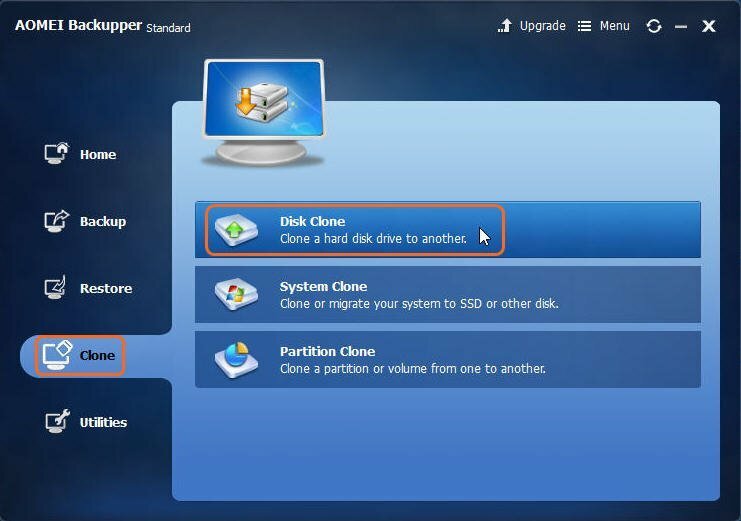 The best clone software should have powerful clone utilities so that you can clone your hard drive to SSD efficiently in a simple operation. Besides, it should be easy to use for most of customers. What customers pay attention to may be the cost of the clone software, including cost in time, energy and money. After deep analysis in clone software, we find AOMEI Backupper is the best tool for replacing desktop hard drive with SSD. It has perfect clone function so that you can complete your clone easily and effectively. And the intellectual user interface enables customers master the operation quickly. What surprises you may be the price of the clone software, you need not pay for the apply of it. All in all, using AOMEI Backupper to replace desktop hard drive can solve your problem in a time-saving, energy-saving and money-saving way. It is the best choice for you. How to replace desktop hard drive with SSD? Now we have choose AOMEI Backupper as the tool of cloning hard drive to SSD. Then I will show you the detail of how to clone a hard drive to SSD. Step1. Download AOMEI Backupper, install it. Plug the SSD where you clone your hard drive to. Launch AOMEI Backupper, click Disk Clone under the Clone option. Step2. Select the disk(Disk0) you wish to clone. Then click next to continue. Step3. Select a destination disk(Disk1) to clone the source disk to. And then click Next. Step4. Confirm the settings in the Operation Summary which indicates the operations that will be executed. And then click Start Clone. 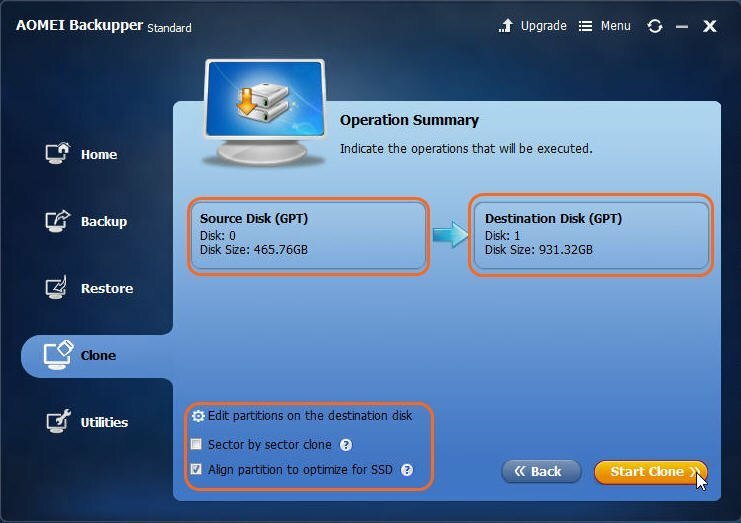 ■ You can set up the detail of the result of clone process, such as Edit partitions on the destination disk, creating a Sector by sector clone, or align partition to optimize for SSD.